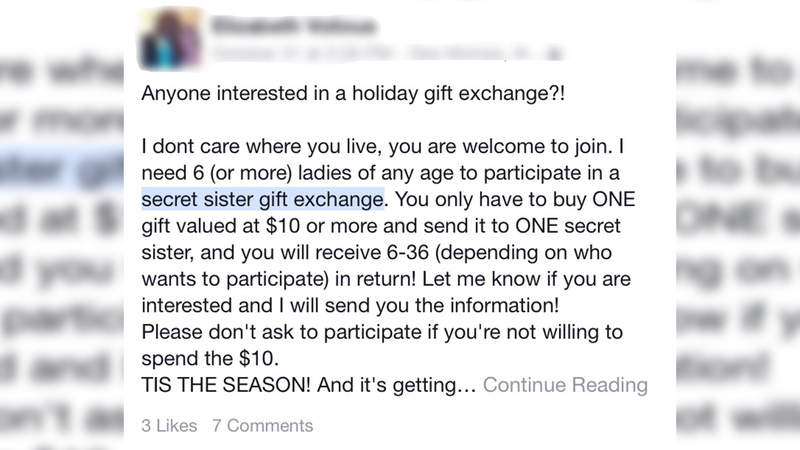 Secret sister gift exchange: It's a scam. 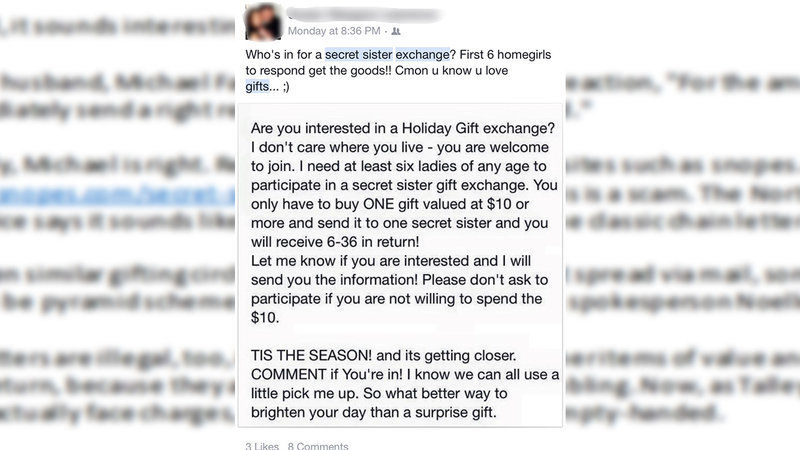 It looks like harmless fun: Friends and family members asking you on social media sites to join them for a "secret sister gift exchange." You send a gift to the first "sister" on the list, then add your name and wait for your gifts to arrive. Some residents we talked to said they hadn't seen this post yet but had mixed responses when asked if it's something they'd consider doing. "I sure would, it sounds interesting," said Gladys Faison. However her husband, Michael Faison, had a much different reaction, "For the amount of money? It would immediately send a bright red flag for me, it really would." Reports are now surfacing on sites such as snopes.com that this is a scam. The North Carolina Attorney General's office says it sounds like a new online variation of the classic chain letter gifting scheme. "We have seen similar gifting circles or gifting clubs in the past spread via mail, some of those actually turned out to be pyramid schemes which are illegal," explains spokesperson Noelle Talley. Chain letters are illegal as well if they request money or other items of value and promise a substantial return because they are considered a form of gambling. As Talley points out, that's not to say you'll actually face charges, but you will likely end up empty-handed. Talley said what's really concerning is that by signing up for this, your name and address could get into the wrong hands. So if you've already joined the gift exchange, keep an eye on your identity and be extra cautious. "We see that a lot with different types of fraud where once people have fallen for one kind of scam that their name and contact information gets sold to other people and that they get solicitations for other kinds of scams," Talley explained.